One mans fight with his waist line! Always busy farther of 4, currently regaining control of my own body! Love my kids, trying to be a good Dad, and a good example. 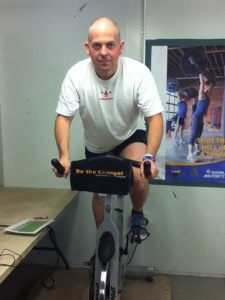 Level 2 Indoor Cycling instructor. Not the most regular blogger, but I get there eventually! Family Time, Get It While You Can! Enter discout code PL10% for a discount on your protein order! Well I thought I best give you a little update on how I am getting on out here in Afghanistan! I have been training hard, sticking to my routine, and even though it is only 3 weeks in, I am sure I can see a difference in my shape already! I have had to get some smaller trousers, and the shoulders and arms on my t-shirts are definitely getting tighter! I am hoping that when I head home, I will actually have some shoulders I can actually be proud of, and then I’ll feel justified in treating myself to a Skinny Chimp vest to show them off in! On the subject of Skinny Chimp, if you are on Twitter or Facebook, give them and the #ChimpArmy a follow, they provide inspiration and motivation every day, and the mixes they put on soundcloud I am sure help me lift more in the gym! I am not connected with the company, just a fan! So what has my training been? Well I have been doing weights Monday to Friday, broken down to shoulders, chest, back, legs then arms, then Mondays and Thursdays I have been taking Performance Cycling classes, and running on a Sunday. Sometimes I have been squeezing in an extra run here and there, nothing big, just always about 5 km just to keep me ticking over! I know, that made me chuckle, classing 5 km as “just” and “ticking over” oh how I never want to go back to how I was before, where I honestly believed I just wasn’t built to be able to run! The thought of running just a mile would fill me with dread! And now I am starting to think about preparing for my biggest challenge so far, the full 26.1 miles that is the Virgin London Marathon! Just like when I signed up for the Perkins Great Eastern Half, I am filled with a huge sense of awe at the daunting task ahead of me, but this time it is a little different, this time I am a runner already, all be it I’m no Mo, but I genuinely enjoy running now, to pound the streets gives me time to meditate, to clear my head, there is something primal about it, almost spiritual, so while yes, 26 miles does seem like a bloody long way, I am actually looking forward to the challenge! 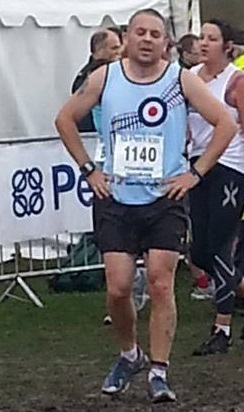 I will of course be #RunningForRAFA again, the RAF Association do some brilliant work, but I will write a blog about why I run for them at another time! But if you would like to help me support this wonderful charity, you can do so here! I owe you all an apology, I must be the worst blogger ever! Seriously, those of you who can fit in working, exercising, family time AND blogging I am in awe of you and have no idea how you do it! Right, well since I last posted, I have changed from being someone who was hoping they could drag my arse around 13.1 miles to a sub 2 hour half marathon runner! (Yes you read that right!) I will do a proper post about the Perkins Great Eastern Run 2013 soon! I have now taken part in a few ParkRuns at the beautiful Ferry Meadows in Peterborough, and I am really enjoying it, the last time I went, I was a lot slower though, as my eldest came with me, and bless her she made it, she finished the 5k in 45 minutes, with me as a very proud Dad! She is now planning her training routes and working out when she can get out running at her Mums house too, I am well proud of her! Oh I ate all my sample box of absolutely brilliant Quest Nutrition bars, again, I will get my review written soon, but safe to say white chocolate & raspberry is heavenly! Sad to say that with all my running training, plus my shift work while I’ve been up at Lossiemouth, I haven’t taken a single indoor cycling class for ages now, but I’ll get to put that right soon, with regular classes while I am in Afghanistan! I didn’t tell you about that you say?? Well yes, for the last few months I have been doing the 1000 mile round trip commute up and down to Lossiemouth in North East Scotland, where I have had the pleasure of working on 617 Sqn, the Dambusters, and now I am preparing to deploy as part of this historic squadrons final deployment operating Tornado! What else, oh yes, well I may have got a little carried away, but as I am enjoying my running so much, I asked the RAF Association if they would allow me to run the Virgin Money London Marathon for them, and they said yes! It is a scary prospect, running for roughly 4 and a half hours non stop, I have a lot to do to get ready for it, including how to fuel myself around the run! I am going to experiment with gels I think, if anyone has any brands or flavours they would recommend, let me know please! I am hoping to raise a lot of money for RAFA, so please support if you can. Right, that’ll do for now, I’ll TRY not to take so long for my next post, but I’m not promising! We are a health and wellness consulting service for both patients and providers. We come to you! A place to learn Fitness, Nutrition, and Health tips that you should integrate into your every day life! Parenting, thrift, home cooking and craft. My blog about fitness, health, nutrition and weight loss. Please join me in my journey to healthy living!